With this new collection of pop/rock gems, Crenshaw proves that his critically-acclaimed debut last year ("Full Length Stereo Recordings") was no fluke. "Victory Songs" is another platter chock full of hooks and harmonies galore. Again, he gets help from his pop aficianado friends DON DIXON and JAMIE HOOVER. 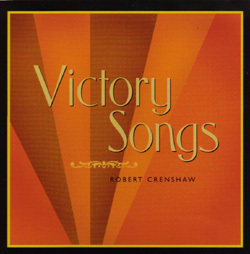 In addition to 10 studio cuts, "Victory Songs" also includes a bonus live track of Crenshaw and his band cranking out a rocked-out version of the MC5 classic "Shakin' Street." The younger brother of pop/rocker Marshall Crenshaw, Robert played in a number of bands around the Detroit area before joining Marshall's band as the drummer and background vocalist through the first five critically-acclaimed releases. After taking a short hiatus from the music business, he returned in 1999 to take center stage with "Full Length Stereo Recordings."